By USHA, SPRINGFIELD Mo. — For the first time in modern USHA Collegiate Championships history, a team title was decided on the final day pending the results of the Men’s Open Singles final. Juan Canales (Lake Forest) and Sam Esser (Missouri State) held the fate of the Men’s Team title in their hands with the result of their singles final. The pair displayed the weekend’s best handball and pure class through three games. Splitting the first two games 21-16, Esser held a 3-0 lead in the tiebreaker but couldn’t pull away. 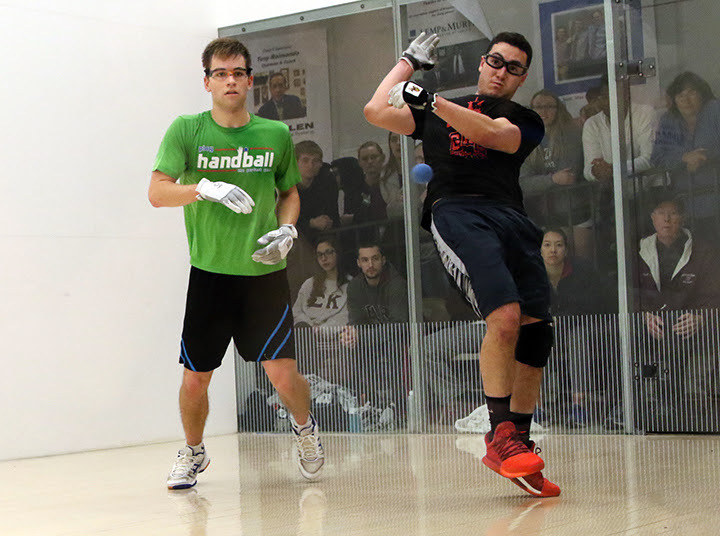 Canales kept coming and ultimately took the lead; however, Esser didn’t go quietly, forcing long rallies before falling 11-8 in front of a packed house. With the win (and some help in another division), Lake Forest edged Missouri State for the Men’s title. That result didn’t effect the Combined Team title, which Missouri State clinched on Saturday. In the Men’s Doubles final, Esser and Max Langmack had too much firepower as they powered their way to victory, defeating Canales and Ricardo Palmas, 21-8, 21-5. Dublin City’s Fiona Tully slammed the Women’s Open events, defeating DCU teammate Meadhbh Ni Dhalaigh in the singles final. The finalists will meet Missouri State’s Taylor Rumping and Christina Pecaut in the doubles final. USHA President LeaAnn Martin with USHA Coach of the Year Tommy Burnett. At the Collegiate Championship Banquet on Saturday, Tommy Burnett was honored with the USHA Coach of the Year Award. USHA President LeaAnn Martin presented the award to Burnett who thanked his family, fellow coaches, volunteers and the handball players who helped make his program a success. 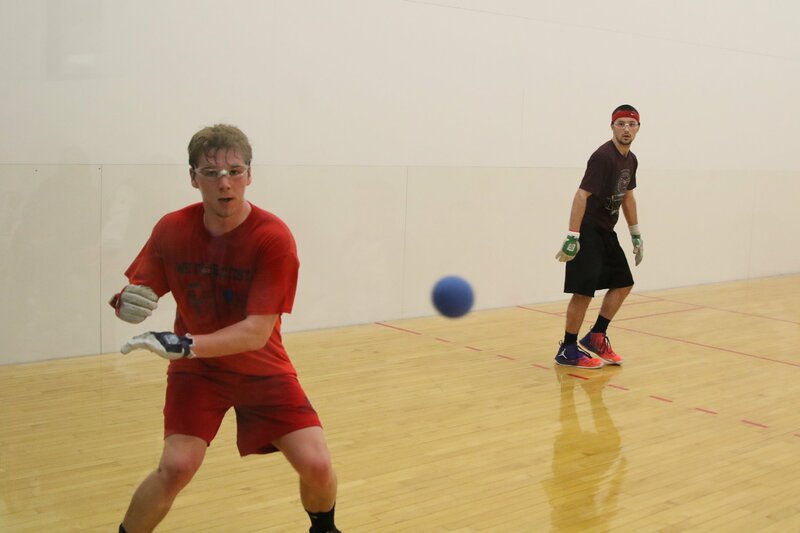 This is the first National Collegiates hosted on the courts since they were dedicated as the Dr. Thomas Burnett Handball Courts back in November. The refinished courts named for the Hall of Fame coach looked pristine as they were refinished and ready for the tournament. The USHA Collegiate National Championships offer a unique format where each player is guaranteed three matches. The first two matches determine final division placement (Open, A, B, etc.). The third match (and beyond if player advances) determine points scored for their team. See the updated draws and results below. Team results will be posted once scores are confirmed. 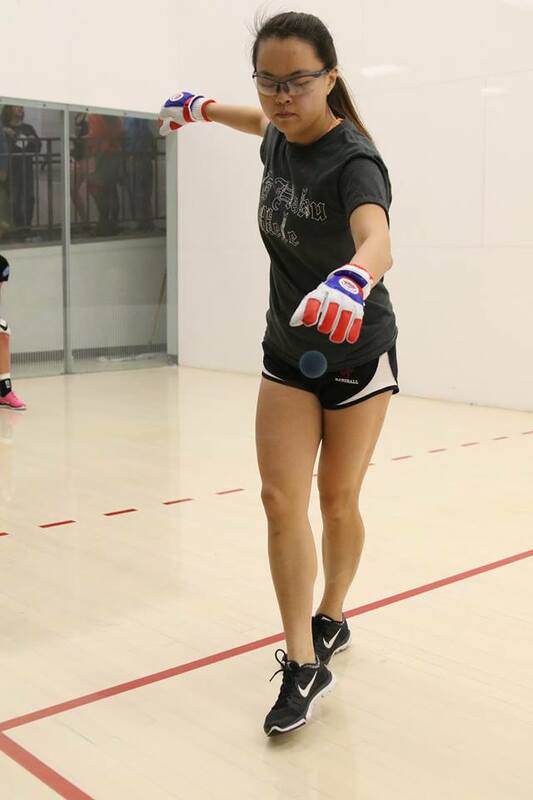 2017 Results (65th USHA Collegiate Handball Championships) HERE. By USHA SPRINGFIELD, Mo. — More than just individual championships are on the line Sunday as the top-two seeds, Juan Canales (Lake Forest) and Sam Esser (Missouri State) meet in the Men’s Open Singles Final. Missouri State and Lake Forest are only a few points away from each other to determine the Men’s Team Championship, pending the results of that final and another in the Men’s A1 final between Ross Colyer (Missouri State) and Austin Biddle (Pacific). Esser and Max Langmack will face-off against Canales and Ricardo Palma in the Men’s Open Doubles final. In Women’s Open action, Fiona Tully (Dublin City) will face teammate Meadhbh Ni Dhalaigh in the singles final. The finalists will meet Missouri State’s Taylor Rumping and Christina Pecaut in the doubles final. (Originally posted by USHA) SPRINGFIELD, Mo. — The host school Missouri State saw two of their players earn All-American and All-Tournament honors on Friday in the 66th USHA National Collegiate Championships. With final Round of 16 divisions established, players of similar skill sets battle for individual titles and attempt to score more points for their team as they advance to further rounds. This year’s All-Americans are Juan Canales (Lake Forest), Max Langmaack (Missouri State), Michael Gaulton (Minnesota State, Mankato) and Sam Esser (Missouri State). Top-seeded Canales reached the finals last year and faces Langmack in tomorrow’s semifinal. On on the other side of the draw, Esser meets Gaulton. Gaulton, a freshman at Minnesota State, Mankato, pulled off a minor upset in upending freshman Anthony Sullivan in the quarterfinals, 21-20, 21-17. In other quarterfinal action, Langmack used a strong supportive home crowd to push him to a tiebreaker victory over David Walsh (Cork Institute of Technology), 21-9, 20-21, 11-3. In Women’s Open action, top-seeded Fiona Tully (Dublin City) advanced to the semifinals and will face Missouri State’s Taylor Rumping, Rumping battled Kristen Hughes in the quarters, winning 20-21, 21-16, 11-7 to earn her All-American status. In the bottom half of the bracket, Leslie Amminson (Memorial University) will face Meadhbh Ni Dhalaigh (Dublin City). Matches begin Saturday morning at 9:00 a.m. Central. The USHA Collegiate National Championships offer a unique format where each player is guaranteed three matches. The first two matches determine final division placement (Open, A, B, etc.). The third match (and beyond if player advances) determine points scored for their team. See the updated draws and results.